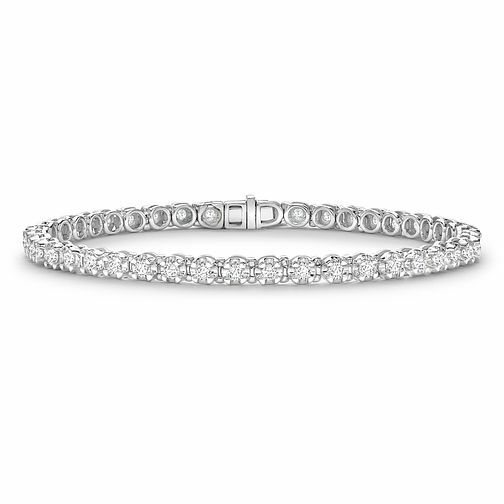 Be glamorous, with this dazzling 9ct white gold bracelet, beautifully set with diamonds for an expansion of glittering texture, perfect for special occasion wear. The total weight of all diamonds combined is 2.0 carats. 9ct White Gold 2ct Diamond Bracelet is rated 3.7 out of 5 by 6. Rated 1 out of 5 by Anonymous from Very dull - diamonds like spots of dust! No colour or clarity rating. Very powdery in colour. Looks like leftover specks of diamond in a sharp cut metal to give it more sparkle. Doesn't work though. Will be returning!